Before having a baby my husband and I went on many outdoor adventures and they often included backpacking into the wilderness. We didn’t want to stop these adventures when we had kids but rather take them with us. We had a lot of nay-sayers but we didn’t let that stop us from making the decision together that we would make the necessary adjustments to take our kid(s). In June of 2017, we were blessed with a beautiful baby girl. 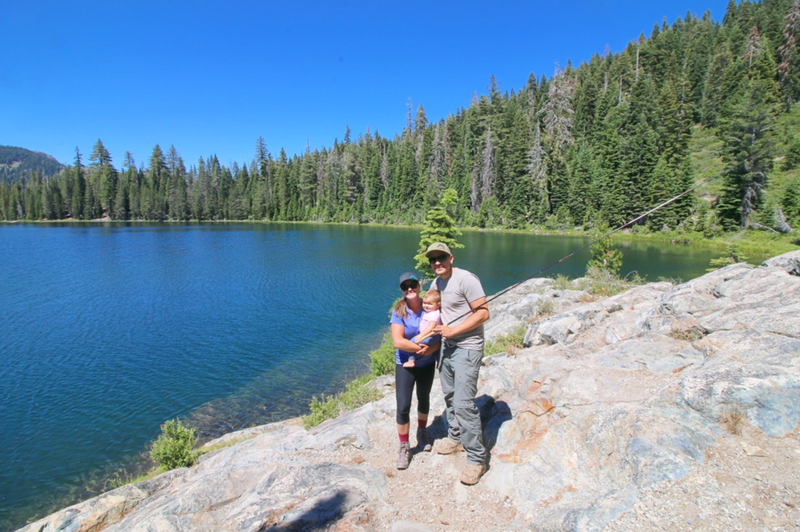 At 10 days old, we took a trip together to Lassen National Park to explore and look at the wildlife and fish. At 2 months, we traveled out of state with her. At 10 weeks, she had her first tent camping trip in the back woods. We have learned tips and tricks along the way but we were really excited to take her on her fist backpacking trip! We took Emerald on her first backpacking trip at 13 months old and we are happy to share our experience with you. If you are researching and you found our blog post we congratulate you and think it is awesome you are looking to take your little ones outdoors with you. It is our suggestion that you are an experienced hiker and that you have gone backpacking in the past before deciding to take the kids. It’s important to know what to expect when you are hiking in the woods, setting up camp, eating meals, water needs, gear and equipment operation etc. Being efficient with your equipment is key when bringing a baby or toddler backpacking. Review Child Carriers, try them on and pick your favorite. With a baby, we recommend a wrap or the Ergo Baby Carrier or one alike for a Toddler (or old enough to strongly hold up their necks) we recommend a child carrier. We have the Poco AG Premium pack by Osprey. Pack your bags and weigh them beforehand. Be prepared for the added weight. 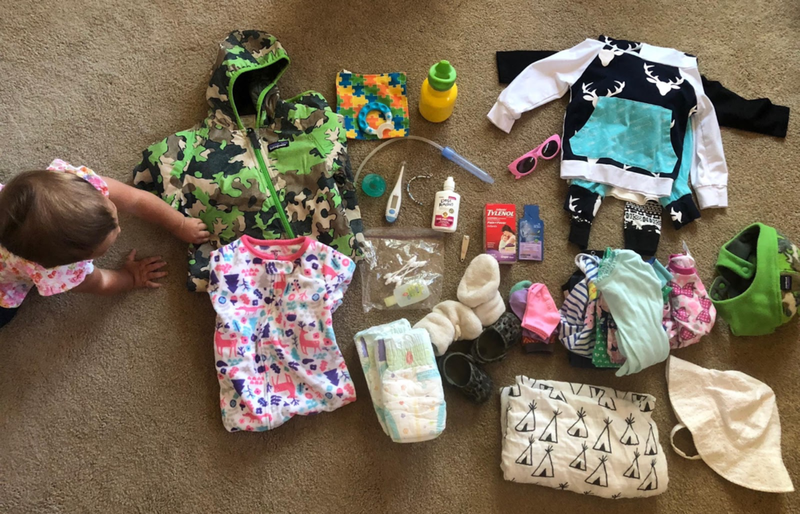 Try the backpack on and do a day hike if you can with your baby/toddler to make sure the pack is comfortable and you get used to it and know what to expect. Layout your bedding like you are in your tent before leaving. Sleeping arrangements are a little more challenging than what it may seem. We learned a lot on our first backpack outing. Recommended bringing a tent, a three/four man. Keeps the spiders, tics, mosquitos, and horse flies at bay. Also doubles as a great and safe play area while putting gear together, taking care of dirty diapers etc. A 2 man works if they are babies/young toddlers but it is cozy. Do bring trekking poles. These are great for many reasons. Helps protect your posture and your back, helps to support the extra weight, preserves your knees, secures your footing and maintains balance, you can move faster with less effort and they engage your arms. Love them! We would encourage you to bring fishing equipment if you’d like. Bring friends along if even it is just for the day. Do not go hiking or backpacking ill prepared. Don’t forget an emergency kit for baby i.e. Baby Tylenol, gripe water etc. Choosing the right pack is important and it is different for everyone. Body shapes, likes and dislikes, personal opinions on how packs should be packed etc. so I am thankful for the options. We chose to go with the Osprey POCO AG Premium. My review of the pack is high because I like that it fits Emerald well and she is comfortable in it. We took this pack on several day hikes beforehand to make sure Emerald liked it and it fit our needs. One dislike about the pack is that it bruised my hips on the hike in after about an hour I could feel it. (It did the same to my husband on our day hikes.) The pack weighed 45 pounds and we went about 4 miles in on this trip to give you an idea. It sounds like Osprey is working on a fix but it could be a year or two down the road. I really like how it so easily adjust in size so my husband and I can both use the pack. I also like the warranty for their products and how fast it is to talk to someone on the phone. I like the big side pouches and I love how the sunshade pops out so easily. The back has a detachable backpack for day use and it worked well for us. Food for your baby/infant. Age dependent, nursing or formula will all factor in for your child’s food needs. Emerald is still breastfeeding but she eats a lot of solids and pureed food as well. We chose to bring, two 3.17oz organic apple sauce pouches (purchased at Costco), two 3.5 ounce organic pureed mixtures (purchased at Target). A small baggie of crackers/cookies of your choice for snacking, a small baggie of cereal for snacking, a cup of pureed prunes (in case of constipation which can be common in babies/toddlers) and rice crackers. We are breast feeding so no need to bring in any formula but if you do, we recommend the powder for a lighter pack but of course bring what makes your baby happy and kept fed. We conveniently placed a pouch and rice crackers on the outside of the pack for the hike in and out just in case she needed a snack on the go. This worked great for us. We ended up having an extra pouch because we caught some Brook Trout and cooked them up for dinner. She ate a whole one to herself. If you do this be extremely cautious of the bones, we chewed hers up first just to be sure. Keep snacks handy during your whole trip, they love snacking and you don’t want them to get hungry. Also, a couple of things to note if you are breastfeeding, Mama’s make sure to eat enough calories and make stops while hiking if necessary to breastfeed if you are not using a front wrap/pack to breast feed while hiking. This is also a great time to let your baby get out of the pack for a little and stretch out. Remember to stop and enjoy the hike rather than rush to get to camp, if your timing allows, your baby will love it. Note, setting up your tent and checking out your surroundings is important to do in the daylight. Our Diaper System turned out to be well organized. We had more diapers than needed by the end of the trip, however, it was better for us to have enough than to be short on them. We chose to do a cloth diaper system for our backpacking trip. We decided to go with the G Diaper with compostable diapers. Yes, you read that right, compostable. So even if you’re at home you can add your ‘wet only’ diapers to your compost. This allowed us to bury the diapers and not have to pack them out. I would recommend disposable diapers for the hike in and out. The G Diaper tend to rub on Emeralds skin causing a little breakage of the skin where the cloth/insert meets the thigh. We are thinking it was from rubbing against the material while in the pack. Next time we will try disposables hiking in and out and for any length of time in the pack i.e. Day hikes. We did a disposable going in and then she used G Diapers from then on out. We do really like the system and believe the company has the environment in mind as they have made an eco-friendly disposable insert that is 100% compostable (wet ones only). We found them on Amazon. I went to target and got the lightest packet of 40 wipes I could find, scent free, sensitive skin wipes that where flushable and it worked great, if you can’t flush them you can’t bury them. Plus, it doubled up to wash hands and wipe down Emerald. After some research, it looks like I am going to try ECO by Naty wipes check them out. The 40 count was nice to have, we had about 20 left over. Clothing is so important and somewhat stressful to pack, you don’t need to much. My thoughts on this, get used to the dirt! They will get dirty so just embrace it and don’t figure on having to change their clothes each time. The weather on our backpacking trip was hot during the day and cold at night. We brought 2 short sleeve onesies. 1 of them she wore on the hike in. 2 polyester, cotton blend pants. 1 she wore in on the hike to protect her legs. 1 long sleeve onesie. A Patagonia Baby Reversible Puff-Ball Bunting. We also like the Columbia Bunting ones found on Amazon. I will never go backpacking without something like this for an emergency. We also brought a fleece bunting onesie with feet covers, this was very handy and perfect for our trip. She wore it in the evening and was comfortable. We also brought a fleece beanie with a chin strap. Don’t forget a swaddle blanket. I almost didn’t bring one but it was a big hit. Emerald loved cuddling into it and it was great for the early morning watching the sunrise not to mention the smell is comforting to little ones. Important Misc. Extras. 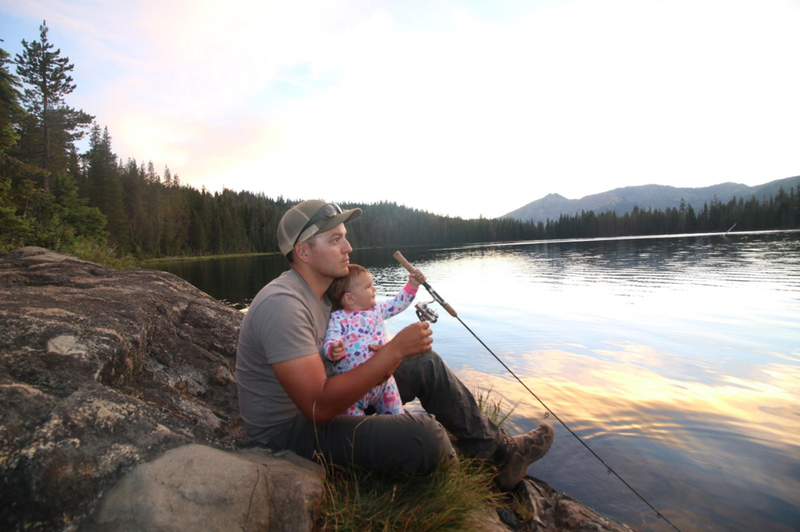 We found that it is important to have a few extra things when taking a baby/toddler into the wilderness. We brought a little thing of gripe water, a small bottle of baby Tylenol (know the dosage beforehand), a nosefrida, saline drops, a few ear swabs and a thermometer. These things are important even if you don’t usually need to use them at home. You are changing the environment for your baby and it’s always important to be safe rather than sorry. Sleeping Arrangement’s, I would say this is where I learned the most on this trip. I figured Emerald could sleep with me in my sleeping bag and that would also make it nice to breastfeed her during the night. We also brought in our 2-man backpacking tent. Emerald always kicks the covers off at night at home and that didn’t change when we were in the wilderness. She took over the sleeping bag and I was left with a little part of the sleeping bag. I woke up several times at night to check on her and try to adjust the pad and sleeping bag. But just like anything I am sure after a couple of these backpacking trips I’ll be able to sleep more soundly especially once we have the system down pact, haha. Long story short, Emerald needs her own sleeping arrangements. Next time, she will have her own sleeping bag or I’ll put her in her bunting gear. I will match her bedding to help me regulate if she is getting cold or hot. I’ll likely put her at our heads or right next to me where I can easily check on her during the night. The Bunting gear could double as her sleeping bag but for this trip, I was worried it was too warm and didn’t want her to overheat. Late summer early Fall and into winter that will be a great option. Us Mamas must remember too that babies (of the right age)/toddlers will tell us if they are not happy. Remember, you don’t need to over pack on toys. We brought in a couple small toys but she mostly just loved playing with our camping gear, sticks and medium (not too small due to choking hazard) sized rocks and random little spiders that tried to dodge her. We brought an emergency blanket that doubled as an outside play mat, this was great! The tent worked wonders for being able to put her in there while we set up, take down, prepare dinner etc. If no chance of rain, keep the rain fly off the tent and enjoy the stars with your little one. If there is a chance of rain add a Muddy Buddy (child rain gear) to your list. We decided to go with the Reach program for safety, backcountry medical assistance and flights. There are restrictions on this, such as needing to have cell reception to make the call. There is also a Garmin inReach Explorer+Satellite Communicator that has been a good recommendation and one that I will explore purchasing. And finally, take it all in, write in a journal, if you have time and watch your little one’s eyes light up as they hear the birds, touch the leaves, play in the dirt, check out the fish in the lake or creek and smell the fresh air. It’s exciting! One more thing, you are awesome for wanting to get your little one(s) outdoors. For Michelle Grabiel, there is nothing that beats spending time with her family and friends in the outdoors. She has a passion for hunting, fishing, health and fitness, culture, travel, capturing moments and highly respects and enjoys the beauty of the wild and all that it has to offer. She is an outdoors woman. She has an obsession to grab her fly rod and reel or bow and arrow and chase the wild things that lurk in the water and wilderness. She is the oldest of three sisters and a brother and they all share a passion for the outdoors. Being the oldest, helping her siblings grow as outdoors people was her greatest reward. Now, as they each find their own way, the outdoors is the pillar that binds them. Michelle’s path landed her at Humboldt State University for a Bachelor’s Degree in International Business. Her degree took her abroad to Switzerland and Italy where her passion for traveling grew. Working full time and carrying a full load at school made time on the water and in the wilderness precious; learning to be efficient at school, on the water and in the field, was the game. After finishing at Humboldt State, home base shifted back to Northern, CA. Michelle seasonally divides her time between trout, steelhead, turkey, deer and elk. As well as throwing into the mix, photography, videography, backpacking, gardening and managing their little farm. She is a new Mama and she has never enjoyed anything more than having her little girl by her side while showing her life’s gifts. Michelle is so excited to bring to the table a woman’s perspective, and a mother’s perspective to HarvestWild and watch what it grows into. 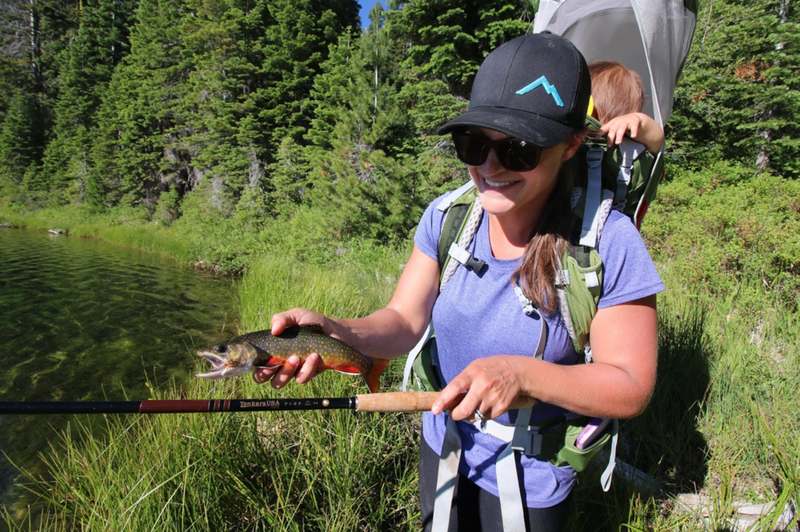 She will continue to make her mark in the hunting and fishing industry all while encouraging women to pursue a known or hidden passion for the world outside.